Jouberthuis, built in 1853 and believed to be the oldest dwelling in Montagu, not only turned 160 years old in November, it also celebrated its 30th year as a Museum! It is referred to as a 'House Museum' and is without doubt one of Montagu's most treasured heritage buildings and assets. 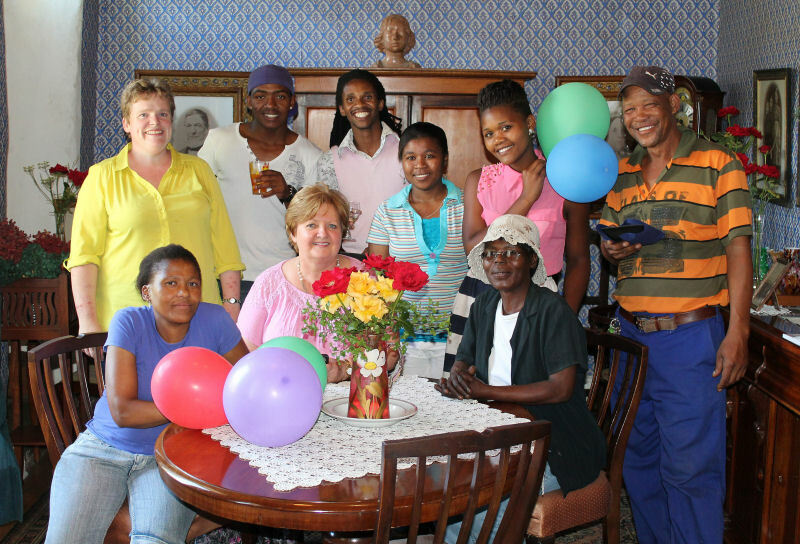 To mark both these special milestones, Annette Cillier, who has developed and cared for Jouberthuis for many years, decided it was time for a special celebration. With the asistance of some of the museum staff, she arranged an Open Day for visitors on Friday 30th November. "What a special day it turned out to be! ", said Annette. "Not only did we see a constant flow of visitors through the door, but also some very unexpected guests! Many of the Joubert descendents paid us a visit - Jouberts from all over, not only from Montagu. We even had wine, made by Jouberts, donated by Juliet Paulsen (nee Joubert - daughter of PJ Joubert and granddaughter of Epsie Joubert - the first Winemakers in Montagu). Braam Joubert, son of P J Joubert, also surprised us by popping in and presenting us with a beautiful tapestry-style waistcoat that was tailormade for him to wear during the very first Muscadel Festival held in Montagu. Annette would like to express her sincere thanks to everyone who helped to make the day as successful and enjoyable as it turned out to be and particularly for the many donations towards the costs of the festivities!